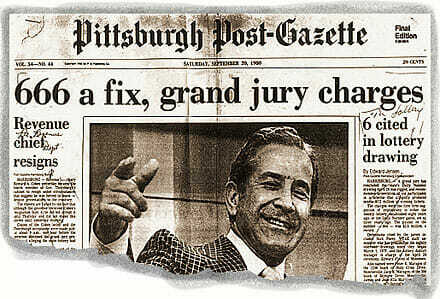 Probably one of the most notorious scandals in lottery history, the 1980 Pennsylvania Lottery Scandal is more commonly known as ‘The Triple Six Fix’ as a result of the three 6’s drawn. Hosting a three-digit game known as the ‘Daily Number’, the Pennsylvania Lottery was the target of this renowned scheme. Weighing down all the balls except four and six, the resulting draw was practically certain to provide a combination of a mixture of sixes and fours. The Daily Number drawn on April the 24th 1980 saw the scheme completed when three sixes were drawn. With a predicted jackpot total of over $3 million, the conspirators were successful in their pursuit. The head of this conspiracy was none other than the Daily Number’s announcer, Nick Perry. Having spoken to two partners he had – Peter and Jack Maragos – Nick approached art director and lettering expert, Joseph Bock. Providing access for several minutes to the lottery machine without the presence of guards, the lottery official, Edward Plevel enlisted Fred Luman (stage man) to switch out the regular balls for the weighted ones prior to and after the lottery drawing had commenced. To discard the evidence, Joseph took the weighted balls to his studio; loaded them in a paint can and burned them for 30 minutes after the live lottery draw was completed. The Maragos brothers were seemingly to blame for the crumbling of the conspiracy having purchased vast amounts of lottery ticket purchases on the eight number combinations. Additionally, they had told their friends and family which provided a great influx of very peculiar, slanted bets. The beginning of the investigation into The Triple Six Fix was initiated by the suspicious outcome of the ball drawing. What actually blew open the case was when an anonymous tip led the authorities to a bar close to Philadelphia, the bar where the Maragos brothers purchased a vast number of their lottery tickets. An employee of the bar had recalled that the brothers had visited the bar. Remembering that they had used a pay phone which they then held up the phone to listen to the lottery ticket machine printing their tickets, the investigators retrieved the phone records to find the phone call trace back to the announcer’s booth at the lottery drawing studio. With this strong implication of Perry, it was understood that he had clearly not acted alone. Investigating further, the Maragos brothers were also implicated and so were the rest of the conspirators.